Digital marketing agencies are becoming a necessity as digitalisation (the leveraging of digital technology and insights from data for concrete customer benefits) becomes a major priority for many businesses. According to the Siemens 2017 African Digitalization Maturity Report, we are an evolving digital economy, which means the realisation of the importance of marketing via digital channels is also on the rise. With this, more people are searching online for products and services, especially in South Africa. Businesses cannot afford not to have an online presence and identity. If you consider some of the insights from the report below, it is evident that more South Africans are online than ever before. South Africa ranks first in terms of ICT Access and Use, and ICT Affordability among other African countries. In relation to digital skills and literacy, South Africa once again ranks first, higher than other African countries. With such a digitally savvy market in South Africa, it can be a tricky for the VP of Sales or the Head of Marketing to pick the right digital marketing agency for all their specific needs. In South Africa, there are a range of small to medium, and larger digital marketing agencies all offering the personal touch and high degree of adaptability that executives are typically after. Before we progress, remember there are a number of fly-by-night operations that will offer you work on the cheap. In most cases, they are not really following best practice and are relatively new to the world of digital marketing. When an agency is giving you big promises with little investment of capital, ask questions and be certain of an agency’s credibility. 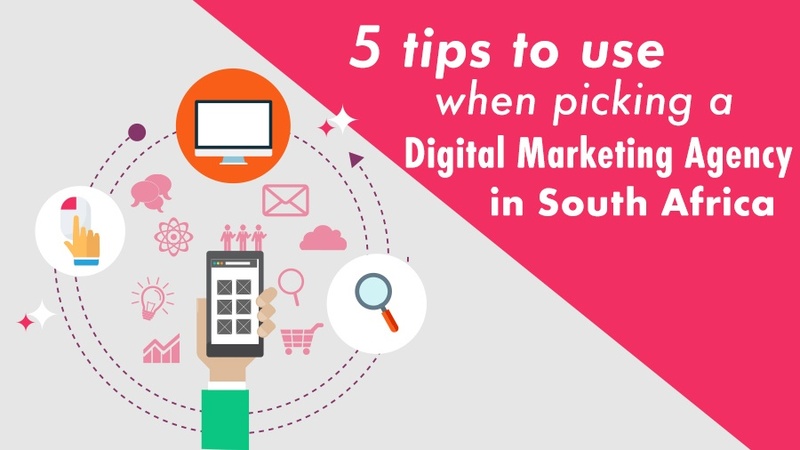 Here are some tips when picking your digital marketing agency in South Africa. When considering a digital marketing agency, understand that an agency who promises you first place rankings in Google searches, within a short period of time, is selling you lies. SEO, and optimisation in general, is not an overnight miracle. SEO specifically takes time to really benefit a website in the long run as search engines like Google take time to index websites into their search results. Slow, yet steady growth is key to a successful digital marketing campaign. A good agency will produce relevant and quality content for a client, practice effective link building (onsite and offsite), know the ins and outs of social media platforms and not sell you instant success. Keyword stuffing – adding multiple keywords into website pages to boost search engine rankings. Making use of hidden links, text, linking schemes, buying backlinks and paying for followers. Please do not consult with a digital marketing agency any further if they practice these black hat tactics. These are truly negative to say the least and will lead not only to a waste of money on your side, but also will tarnish your online brand reputation. Not only will your website experience penalties from Google and search engines, but you will also lose already-existing rankings for keywords you are trying to rank for. Be sure that you are always asking an agency questions about their credentials. Check if they have case studies, testimonials and a list of quality references that you can contact. You want to know if down the line an agency will be able to deliver quality work and results. Do a bit of homework before you even consider talking budget with a digital marketing agency. Large agencies may have all the awards and accolades, but this does not necessarily mean that they are the right fit for you. This is especially true in the South African economic climate. The assumption is that huge agencies must be the best. However, we have had many current clients come to us unsatisfied from the experience of a bigger digital marketing agency and choosing to rather go with a smaller agency who can give them more personal support. The problem with larger agencies is that they typically have a small team of senior members and a huge workforce of juniors lacking the digital marketing expertise that you require. As a result, in large agencies, senior marketers are often delegating tasks to juniors who are inexperienced. This can result in questionable quality work. However, in a smaller agency, there are often fewer clients and the agency employs a smaller team of highly skilled professionals who have the capacity to deal with clients’ briefs and issues hands-on, rather than delegate tasks to a junior. Since you may be new to the world of digital marketing and are still trying to prove digital marketing ROI, you may want to go the route of hiring a cheaper digital marketing agency in South Africa. When you go the cheap route, you generally get cheap results. Do not overthink costs too much and look for a digital agency whose quality of work speaks for itself. You want a digital marketing agency that understands best practice, has a good reputation and track record, and practices good ethics in terms of operations and their quality assurance. Doing so will save you time and money at the end of the day. By following these tips, you will be able to find a quality digital marketing agency.